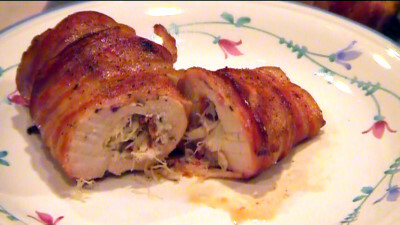 SmokingPit.com - Bacon wrapped chicken breast stuffed with Dungeness crab meat - Slow cooked on a Treager Pellet grill. Take 2 thick boneless chicken breasts, wash and cut off any fat. Using a sharp knife, cut a 1" to 2 " cut in the side of the chicken breasts. In a sawing motion, carefully open up a inner pocket the length of the breasts. Carefully stuff the chicken breasts with the crab mix. 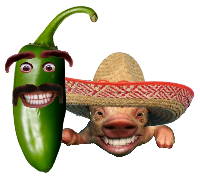 Try to avoid tearing the chicken. 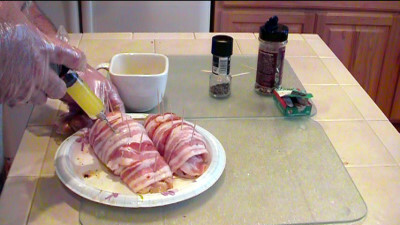 Once stuffed, place in a Ziploc bag and pour a cup of Zesty Italian dressing over the chicken. Shake and refrigerate for at least 1hour preferably over night. Remove from refrigerator and Ziploc bag. 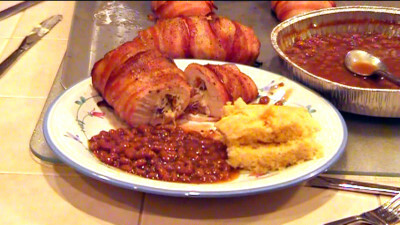 Tightly wrap chicken breast with thin sliced bacon and let stand until near room temperature. Preheat smoker/cooker to 225. I recommend a 50%/50% mix of Hickory and Apple wood pellets or chunks. Place chicken breasts on grill. Traeger grills, put on smoke for the first 30 minutes then 280 to 300 degrees. Mist the chicken with apple juice a couple times during cooking duration. When the chicken reaches 40 degrees put your beans (sprinkled with brown sugar) on the grill and start baking corn bread. Chicken will be done when the thickest part is at 165 degrees. Serve with smoked beans and corn bread with butter and honey.